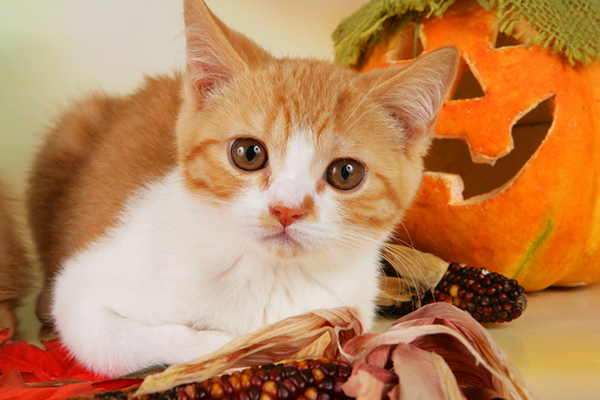 What Halloween candies are toxic to cats and how do you keep your cat from escaping when trick-or-treaters stop by? Let’s review Halloween dangers for cats. Cats may be a major Halloween symbol, but there are some parts of this holiday that just don’t mix with our feline friends. 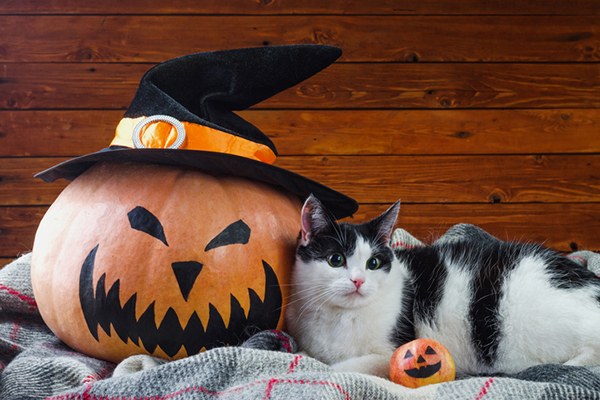 Being aware of the potential Halloween dangers for cats will help kitty parents celebrate this holiday with peace of mind. What Halloween candies are toxic to cats? Which Halloween candies are toxic to cats? Photography © absolutimages | Thinkstock. It’s all a matter of taste — cats simply don’t have sweet tooths. However, felines may be attracted to the high fat content found in many candies. And since some candies also contain toxic ingredients, it’s much safer to keep all candy away from your cats. Chocolate tops the list of candy that is toxic to cats. All chocolate — even white chocolate and unsweetened baking chocolate — contains two potentially dangerous ingredients: caffeine and theobromine, both of which are stimulants. Non-chocolate treats can be just as harmful. Cats don’t usually crave sugar, but don’t let your kitty be the exception! Sugar itself isn’t toxic, but too much can cause gas and diarrhea and lead to obesity and diabetes. Lollipop sticks and smaller bite-size candies are also choking hazards for cats. Discarded candy wrappers are dangerous to cats, too. Curious kitties may leap into action and bat at shiny, interesting wrappers, but enticing smells may be too hard to resist. Cats who chew on wrappers may accidentally swallow them, and the sharp edges can irritate and damage their digestive organs. What Halloween décor is dangerous to cats? As you transform your humble home into a haunted extravaganza, be aware of your cat’s spook meter — even the most sociable and brave feline might be scared by noisy, animated decorations. Dried cornstalks look festive, but may be harmful. Corn husks and the silky fibers are choking hazards and if cats do swallow them, they’re not easily digestible and may cause stomach upset. Halloween-themed balloons are another threat — ribbons can get tangled up in your cat’s intestines or cause blockages in their digestive tracts. Dangling electrical cords could be a double whammy. Cats who chew on electrical cords can suffer mouth, tongue and gum burns or electrocution, and curious, playful cats can get tangled up in the cords. In an effort to free themselves, felines could accidentally drag down decorations or knock over fragile items, resulting in cuts or bruises. Flickering flames can easily tempt an inquisitive paw, which could cause burns or even fires. Please don’t leave your cat alone with any unattended candles. Are other Halloween traditions dangerous to cats? Grinning Jack-o-lanterns are iconic this time of year, but they’re a Halloween danger for cats. Harmful bacteria grows and multiplies as pumpkins rot. And, what’s to stop your cat’s inner wild child from sampling some pumpkin? If your cat ingests these bacteria, she can experience severe nausea, diarrhea and intestinal distress. Adorable Halloween costumes for your cat are fun, but never leave your cat unattended while in costume — she can injure herself while trying to get it off. And please don’t force your kitty into a costume against her will. Doing so will stress your cat (and you!) out. What do you do with your cat and Halloween trick-or-treaters? Do you worry your cats will zip out the door when you greet trick-or-treaters? Cats may startle at the sight of unfamiliar people or noises, race away in any direction and get lost. Secure cats in a bedroom or back room far away from the front door with ample food, water, toys and access to a litter box. Make this space a cat-friendly paradise with interesting toys, scratching posts, cozy beds and cat caves. Consider greeting trick-or-treaters outside on your front porch. Equip your cats with ID (just in case): Microchips and collars with your contact information are a winning dynamic duo of protection. Teach your cat to come to you — our cat Bean is very vocal and races to me when I whistle or call his name. Thumbnail: Photography © mihakonceptcorn | Thinkstock. Brandy beard im so sorrt aboutwhat happened… I have a black kitten named ember, and now I know she might be in danger… Thanks for telling me..
You are so right. Cats are the #1 victims of tricks on Halloween. My Alamo and Mink are indoors. As much as I know us Cat Lovers hate to hear about this subject, this list overlooks one of the most sinister (But very real) dangers cats can face on Halloween, Human beings, specifically Very Sick ones. Although this issue is uncommon, it’s not exactly rare. Not only have I known 3 people who had cats fall victim to terrible acts of cruelty on Halloween, but I personally had a cat who met a horrific fate as a result of a Halloween “Prank”. Black cats are most at risk, but individuals who commit acts of animal torture and cruelty don’t always care about appearance. For this reason I would encourage everyone to keep all of their cats (even outdoor cats, and those who don’t normally wonder away) indoors on Halloween. A few years back ( before I switched my cats to NO unsupervised outside time at all), My sweet black kitty Sassy, was stolen from my porch on Halloween night. The next day she was thrown back over my fence in a Paper bag with “Happy Halloween” written on it, I won’t get to awful with details, but she was not in one piece :( . Several neighbors reported cats either missing or returned mutilated, that Halloween. Thankfully we have since relocated. Thank you for all the information. I greatly appreciate it all.